This is a summary of the history of the 379th that can be found, in its entirety, at the 379th Bomb Group Association’s website. The 379th Bomb Group was activated on November 26, 1942. It was part of the 8th Air Force, 1st Division, 41st Wing and it consisted of 4 squadrons: the 524th, 525th, 526th and 527th. The Group arrived at Kimbolton, England, AAF 117 in May 1943 and its first mission was to attack German U-boat pens in France. The Group flew B-17s, a heavy bomber used during World War II. Kimbolton is a small village about 24 miles east of Cambridge, England. 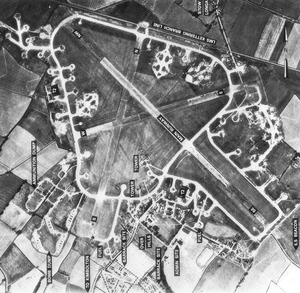 The flat land in that area of England was perfect for building airfields and the one at Kimbolton, like many of the airfields built in England at the time, was originally designed for fighter planes. When the British leased the airfields to America, they had to improve the runways to accommodate bombing planes which are larger and heavier than their fighter counterparts. In June 1943, the use of a geometric symbol with a white letter was introduced as a means to quickly identify the bombardment wing. The triangle denoted the B-17 Bombardment Wing, later known as the 1st Division. These symbols were painted on the vertical stabilizer of the airplane’s tail. 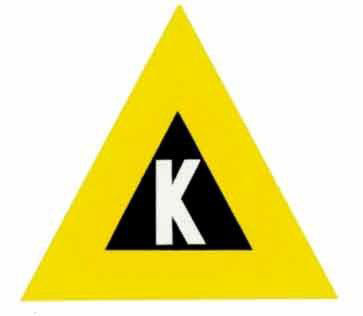 The 379th was assigned the letter “K”, aka the “Triangle K” Group, and sported a yellow triangle. The 379th received two Presidential Unit citations for its accomplishments in combat. It last combat mission was flown in April 1945 and it remained active at Kimbolton for about another 3 years. During its 5 years in Kimbolton, nearly 6,000 personnel were stationed at the base. According to one record, 345 B-17s were assigned to the Triangle K Group. Of those 345, 141 were lost in combat with 57% of those lost between May 1943 and March 1944. Today, part of the Kimbolton Airfield’s tarmac still exists and it is used as a racetrack for the Hunts Kart Racing Club. To this day, the members of the racing club still find detritus from the War in the area surrounding the track. The club also has a nice display about the 379th in its club house, complete with photos, found parts, and all kinds of history. They are proud of their track’s heritage! This is not entirely correct. Only the 379th triangle was outlined in yellow. Each of the other bomb groups of the 1st Division of the 8th Air Force had a different color scheme. Thank you! I will look into this and correct if needed. I’m almost positive I pulled that from the 379th Bomb Group Association’s website but cannot find the reference…missy. Correction made! Thank you for keeping me honest!…missy. Thanks! If I find an appropriate spot on my site, would you mind if I used these images? …missy. Our respective groups, 379th and 384th were in the same CBW. Please use the images if they will be helpful for your BG. The originals came from The National Archives via FOLD3. The images are from official government files via Fold3.